During the civil commotions that preceded the Declaration of Independence, tea drinking was proscribed. 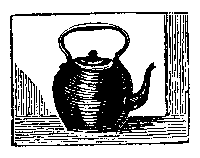 Good Whig husbands generally found it easy to abstain from a decoction that was deemed unpatriotic and had become unpopular; but their wives longed for the forbidden beverage and not infrequently enjoyed it. During the summer of ‘76, tea became scarce in the interior of the country; those who possessed a stock of the article held it fast, in expectation of a great rise in its value. This led to female insurrection in several of the counties that bordered upon the Hudson River. Storehouses containing the coveted Bohea, at that time, almost the only kind of tea in general use, were besieged by thirsty housewives, sometimes for several days in succession, and for the most part successfully; the owners being at length compelled to sell by retail at reasonable prices. 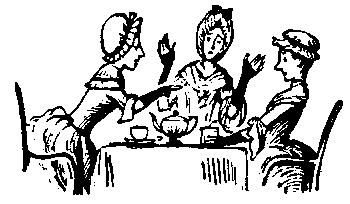 It was a short time after the Battle of White Plains that the excursion commonly called “The Westchester Tea-Party” took place. During the previous summer, a man whose name was John Arthur, who for some time had kept a grocery store in the City of New York, was induced, in consequence of the revolutionary troubles, to break up his establishment and remove to a sequestered place in Westchester County, on the borders of the town now known as New Castle. He brought with him some articles of merchandise, part of his old stock in trade; among which was a quantity of Bohea tea. 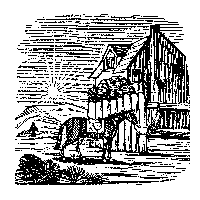 They scolded so long and threatened so fiercely that the gallant militia officer was glad at length to buy his peace by surrendering to them one chest from his store, upon the terms they proposed. The Amazons then withdrew, but Colonel Brinkerhoff dreaded their return, and a few days afterward sold out his entire stock of tea to some New York speculators, who, for fear of another female outbreak, “precipitately forwarded the nefarious stuff” up the Hudson River to Albany. Apprehensive of a similar foray, John Arthur had carefully concealed from female inquisition the fact that he held in his possession sundry chests of the delectable leaf. But by some means, it became whispered about that such was the case. This news was carried from farmhouse to farmhouse, until at length it reached the good housewives along the manor lands of the lower Hudson, who had so long abstained from the bewitching infusion as to almost forget its joyous qualities. The information that now came from the direction of Bedford brought back their old appetites. Their thoughts hovered about Bohea throughout the day; they fancied its fragrance during the visions of the night. The tea was within their reach and not many miles distant. Daughters of Eve as they were, the time soon came when they could no longer resist the temptation. As the giant in the nursery tale, who, when he had smelled the blood of an Englishman, gave way to his cannibal instincts and resolved to have some; so the dames of Philipse’s Manor, when in dreams they had scented the treasure in their vicinity, felt their old tastes revive. They determined once more to enjoy the “liquor they loved” by coming down upon the ex-grocer Arthur for the needful material. A rendezvous was consequently agreed upon, at the most convenient place. 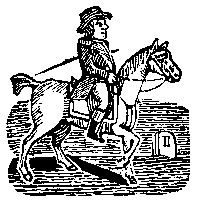 At the appointed time upon an autumnal morning, thirty females the precincts of Weckquaskeck (Dobbs Ferry), Tarrytown, Sleepy Hollow and Sing-Sing, all on horseback, assembled, eager for the enterprise. Placing herself at the head of her forces, Madam Orser at once put them in motion towards Arthur’s hamlet. For the first few miles, their march was uneventful, but at length they entered a region where they had never been before; where from the number of the roads and the distances of the farmhouses from each other, they became bewildered and unable to proceed with any certainty. In this state of perplexity, they pulled up at a place where the road forked, and awaited the approach of someone who might point out the proper route. 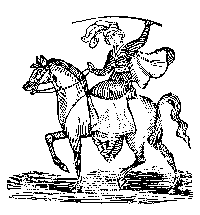 Presently, a mounted traveler was seen approaching. As fate would have it, it was Arthur himself; a short time previous he had taken his departure from home on a journey. 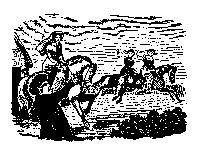 He came up, and his surprise at the appearance of the cavalcade grew into astonishment when the captain of the band inquired of him the way that most directly led to John Arthur’s habitation. Arthur was a wary man, seldom off guard; before he gave the tea-hunters a direct answer, he had the circumspection to draw from them the object of their visit. He then accompanied them a short distance, and after having carefully indicated the most circuitous of all the routes that led to his domicile, he himself took the shortest direction back, in order to put his castle into a posture of defense. This he was better able to do than most men would have been, for the females of his own household were numerous and also warlike. Four of them were remarkable for their prowess and personal strength: Dame Arthur, her two maiden sisters, and an African girl with scarred face and ferocious aspect, who was—or had been—a slave. Having warned his helpmate of the approaching danger, Arthur (himself a man of peace and averse to feminine broils) quietly withdrew. When at length the enemy appeared, and surrounded the house, its Amazonian mistress was ready for them, and “laughed a siege to scorn” having previously barricaded the doors and windows of the lower story, and armed herself, her sisters and retainer with tongs, pokers, spits and broomsticks. The assailants, having been refused admittance and set at defiance, proposed a parley, whereupon an upper window was opened. A demand for a box of tea (with promise of future compensation) was rejected. A similar requisition (upon payment of a just and proper sum) was also refused. Instead, the commander of the post held out to the besiegers the promise that when the master returned home, he would positively sell them what tea they wanted, provided they would now peaceably withdraw from the premises. After reconnoitering the fortress, Madam Orser and her followers resolved themselves into a council of war. The result of their deliberation was that the garrison would probably make desperate defense, and although the courage of the besiegers remained unshaken (and their ability to capture the place by storm was undoubted), they were yet unwilling at present to resort to bloody extremities. The bold dragoons concluded, therefore, to accept the proposition made by Dame Arthur, whereupon they raised their siege and retired. Soon after, according to the treaty stipulation, they were furnished with a large quantity of the much-loved Bohea, and during the whole ensuing winter of that difficult year, their hearts were gladdened by its sprightly decoctions.